Catastrophic events have reinforced the critical importance of safety and risk mitigation strategies in power plants worldwide. Demand for increased generator rating, without increasing the physical size of the generator, has led to hydrogen being utilized as a coolant medium. The minimum size (megawatt output) of a generator to be considered for the use of hydrogen as a cooling medium will vary between manufacturers, but the fact that hydrogen has better heat transfer characteristics and is less dense (providing less windage losses) has made it a standard coolant for large turbo-generators. 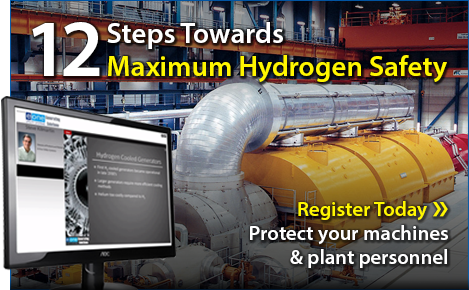 This must-see webinar will discuss the pros and cons of using hydrogen, methods used to measure gas purity and dew point, and issues to consider along with the 12 Steps towards ensuring maximum hydrogen safety for the protection of your machines and plant personnel. questions and answers after the event for another 15 minutes. All event registrants will receive a copy of the presentation!